You can luckily enjoy a delicious traditional French meal, and gluten free meal- Crêpes! The traditional Breton crepes are called galettes de sarrasin which are made from 100% buckwheat flour (blè noir or farine de sarrasin), and completely suitable for your gluten free needs. Be sure to be cautious! When ordering a galette, always ask for the ones that are sans gluten or without gluten, or simply ask for ones avec sarrasin seulement or with only buckwheat flour. Krugen is truly the definition of cool, and you won’t think you are in an old school crêperie anymore. Not only is the interior cool, but the crêpes are too, and filled with ingredients from Breton. The pretty and colorful Parisian delicacies are usually suitable for special dietary gluten free restrictions! Worried you can’t eat pastries and baguettes when coming to Paris? There is absolutely no need to go bread-less in Paris on a GF diet if you know the right places to go… keep reading to discover the best gluten free bakeries in Paris. Helmut Newcake, the first patisserie offering traditional French cakes and pastries that are 100% gluten free, also has an amazing Sunday brunch and a shop where you can buy gluten free ingredients to cook with! This place should be your go-to for all things gluten free. Be sure to make reservations for their Sunday brunch. A brilliant bakery offering a wide range of gluten free breads and pastries made with natural gluten substitutes. Chambelland is one of our most recommended gluten free Paris bakeries. Thank You, My Deer is a cozy restaurant with a 100% gluten free menu in the 11th arrondissement. They also have a shop where you can purchase gluten free treats and ingredients to cook with yourself. Don’t miss out on their gluten free brunch as well! TYMD is a wonderful gluten free Paris options. Season, a coffee shop, juice bar and neobistro, has a constantly changing menu always featuring gluten free options. Do try the acai bowls which are both gluten free and delicious! A nice gluten free Paris treat. At Maison Bastille, you can have homemade salads and soups, most of which are gluten free! It should be on your list of gluten fee Paris options. With two Café Pinson addresses in Paris, you can enjoy gluten free goodies at the location nearest to you! A nice gluten free Paris spot. Wild and the Moon is one of the coolest veggie and GF places in Paris as its sleek interior design makes dining there a real treat! Wild and the Moon is a great gluten free Paris address. Naturalia and Bio c’Bon are organic grocery store chains in Paris, which undoubtedly will have exactly what you’re used to purchasing back home. This way, you can cook gluten free at chez vous in Paris! At Noglu you are completely safe from gluten! Their entire menu is 100% gluten free, and they even have a charming bakery on site. However be warned, the prices for this convenience are quite high… Overall, a great gluten free Paris spot. Le Bichat allows you to eat out GF and also not spend too much! This restaurant is always cheerful with gluten free options, and its best selling point, its also cheap. 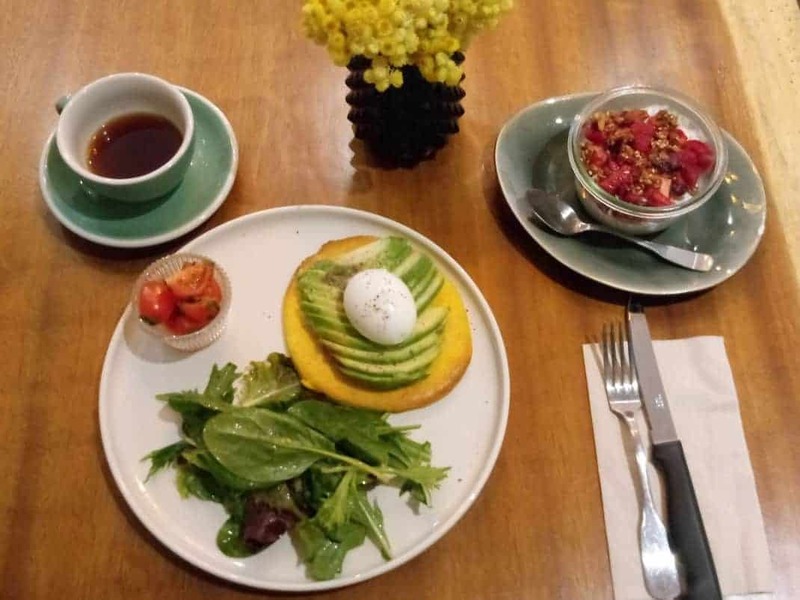 For various vegetarian and gluten free dishes in a transformed faucet factory near the Canal Saint-Martin district, head to Soya! Their brunches €27 will serve you a hot starter, many cold salads and also a dessert. Be sure to make a reservation! Verjus is a very classy restaurant with an even classier menu. It is run by American chef Braden Perkins and his partner Laura Adrian. These chefs change their menu regularly, but it will always feature gluten free options. Verjus is a wonderful gluten free Paris spot.